Jeremy Horst is likely having the greatest year of his life. A year after making his Major League debut with Cincinnati in 2011, Horst has pitched well enough to cement a spot in the Majors with the Phillies in 2012. Horst has been dominant: in 18 IP with the Phils, Horst has 22 Ks and has only allowed two ER, holding lefties to an impressive .214/.290/.214 line and righties to a neutered .189/.293/.278 line. On Monday, the Phils placed Horst on paternity leave to mark the arrival of his family’s second child and called-up Phillippe Aumont in his place. Congratulations again to the Horst family. There was not much doubt as to what would happen with Horst when he returned from the paternity list. 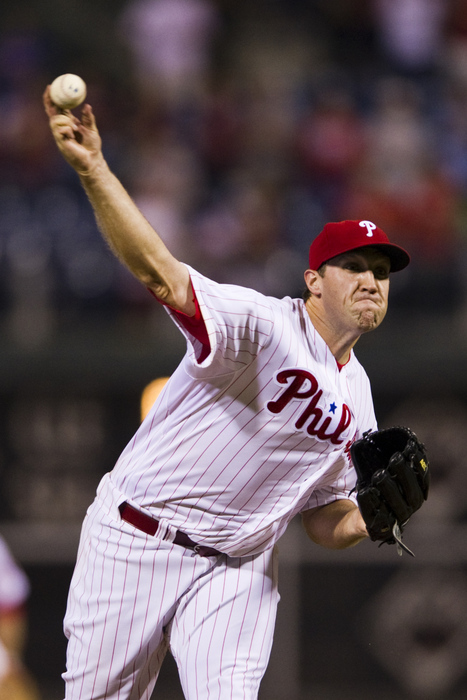 As expected, Horst returned immediately to the Phillies, activated Thursday, and pitching a perfect tenth with two Ks. And, for the most part, it was expected that Aumont would return to Triple-A Lehigh Valley once Horst returned. Except, that did not happen. Instead, Aumont remained on the active 25-man roster and threw a scoreless inning on Thursday night. Michael Schwimer was instead optioned to Triple-A. Schwimer was last seen on Sunday, pitching his way out of a self-inflicted bases-loaded jam in the ninth by striking out back-to-back batters. Jim Salisbury of Comcast SportsNet is reporting that Schwimer had been suffering from arm soreness. Salisbury cited two sources with the club who thought Schwimer should have been placed on the DL instead of being demoted, which would have allowed Schwimer to continue to receive Major League pay and keep his service clock running. If Schwimer is healthy enough to pitch, which from Salisbury’s sources, he is not, he should not have been sent down. Schwimer has appeared in 35 games this year for the Phils and has pitched well. Schwimer has changed his approach to feature his slider more, relying on a 1-2 mix of fastball slider. For the most part, Schwimer has avoided the long-ball and has reduced his walk-rate. His fielding-independent pitching numbers from FanGraphs suggest his adjusted ERA would be around 3.71 while continuing to average over a K/IP. Meanwhile, since arriving in Philadelphia, Josh Lindblom has been an unmitigated disaster. The 6’4″ righty from Lafayette, IN has appeared in nine games for the Phils, averaging exactly a K/IP while also averaging nearly a BB/IP as well (7.88 BB/9 IP). Lindblom has allowed 3 HR, getting hit hard on his two and four-seam fastballs. While Lindblom has held opposing hitters to a .226 BA, opposing hitters are slugging .581 against Lindblom, a number that would trail only Ryan Braun on the NL leader board. The .355 ISO mark opposing hitters are putting up against Lindblom would easily lead the NL, as well. Lindblom obviously will get more rope because of his inclusion in the Shane Victorino trade, but at this stage, Schwimer being 26 and Lindblom being 25, Schwimer seems to be at a better position to turn the corner. Schwimer has better numbers in his career at limiting home runs, is more adept at striking batters out, and his BB/9 IP are trending down instead of trending up like Lindblom’s. As my colleague Eric Seidman wrote after his acquisition, the Phillies may have been better-served to investigate Lindblom’s performance away from Dodger’s Stadium’s friendly confines further. This situation becomes a little more complicated because of the fact that Schwimer may be hurt and the entire situation could have been avoided, but if Schwimer is well enough to pitch, Lindblom should have been the odd man out.